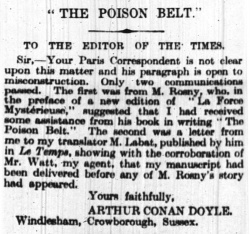 The Poison Belt is a letter written by Arthur Conan Doyle first published in The Times on 2 may 1914. Sir, — Your Paris Correspondent is not clear upon this matter and his paragraph is open to misconstruction. Only two communications passed. The first was from M. Rosny, who, in the preface of a new edition of La Force Mysterieuse, suggested that I had received some assistance from his book in writing The Poison Belt. The second was a letter from me to my translator M. Labat, published by him in Le Temps showing with the corroboration of Mr. Watt, my agent, that my manuscript had been delivered before any of M. Rosny's story had appeared. This page was last edited on 7 July 2016, at 13:41.